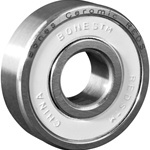 NEW Bones CERAMIC Super Reds bearings in 8 pack Regular 608 bearings. The story of Ceramic Super Reds is simple. Take the superior steel used in Super Reds and swap the steel balls for grade 5, silicone nitride, hot isostatic-pressed ceramic balls and you have?a ceramic bearing for the discerning skater without a trust fund. Top quality, ultra high-performance bearings for 40% less than the price of Bones Swiss Ceramics. Is this a no brainer or what? You Bones Swiss skates have the chance to move up to Bones Ceramic Super Reds for about 50% more (instead of 150% more!). We believe some skaters who have chosen Bones Swiss will switch to Ceramic Super Reds when they learn how amazing they are. Bones Ceramic Super Reds are lighter, and provide faster acceleration, because the balls weigh much less. They create less friction and are thus faster than Super Reds, with or without lubricant! When you get dirt into your ceramic Super Reds, the ceramic balls will help to repolish the steel races flat again, providing a self-healing benefit because ceramic balls are so much harder than steel. Finally, ceramic balls won?t rust, further lengthening their life. Ceramic Super Reds use a bone colored shield with laser engraved outer races for identification, and are packaged in a new cream and gold 8-pack box. Too rich for your blood right now? Go with Bones SUPER Reds! - Each package comes with set of bearings, pre-lubed with Speed Cream, instructions and a sticker.